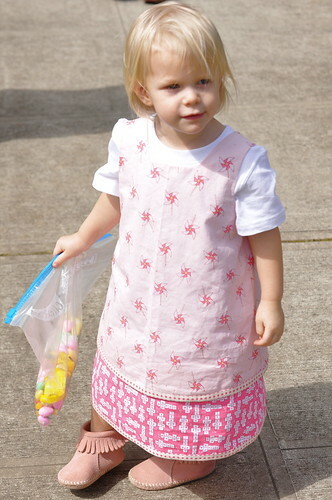 I did manage to make an Easter dress for Kit in the middle of some other deadline sewing. At first I wasn't sure I would because I figured that there was no way that the weather could be nice enough to warrant a spring/summer dress. 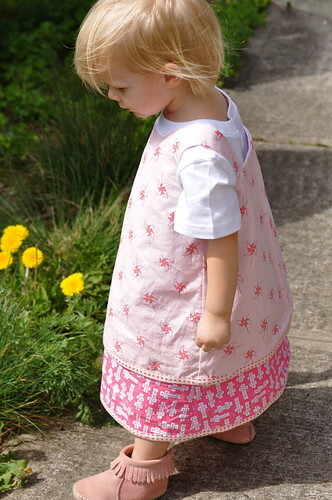 However, the forecast proved me wrong and on Thursday I was quickly cutting out the Sunny Scallop Dress by my friend Jona. I had purchased the fabric in February when we were at the beach, and it was sitting there waiting to become a summer dress for Kit. Since we *are* still in Portland where nice means a high of 68, it had to be layered with a tshirt and leggings, but that made it no less cute. I made the 2T which is still a little big on her - it will definitely make it through the summer and maybe even beyond as a layered piece through the fall. The pattern is beautifully written and comes together very quickly. The lower layer is a full lining for the top layer. I pieced together some white sheeting for under the dress with the underskirt section so the darker print didn't show through. The lining construction cleverly sandwiches the seams inside the dress until the lower section, where you snip and turn it to sew the seam in the other direction. It makes for a really nicely finished garment. I serged all of my seams (because now I can!) and am so pleased with how it turned out. The polka dot binding was a last minute find in the scrap drawer - it was a fat quarter from a set of fabric that I won a couple of years ago. It was the perfect finishing touch to the dress. I'll definitely be making more of these for summer. The whole thing only took a couple of hours, once I had traced the pattern. Luckily the pattern goes to size 9/10 so we'll be able to use it for several years. I'm going to grade it out a bit bigger for Annika because now she wants one too. p.s. while Jona is a friend and gave me a copy of the pattern, she did not ask me to make it or to review it. I'm really that big a fan of her patterns. 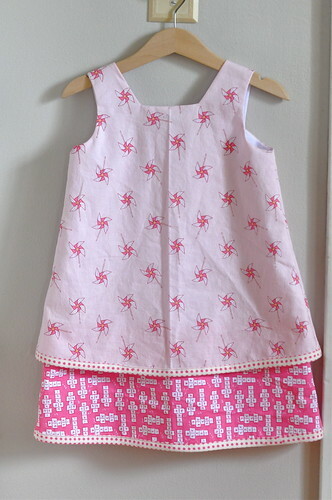 I have also made the Shop Girl Apron and Annika has made the Evelyn Apron Skirt with equal happiness and success. Thanks Jona! It looks so darling on her and I'm glad she's got some room to grow in it. Thanks for the sweet review!